The suitcases come in many forms -- a sea of weathered colors -- as they make their way into Colombia. Some have wheels, broken or about to give out. Others are just makeshift bags, tied together with string or tape, securing the possessions of a previous life on its way to an uncertain future. Many bear the now-dirtied yellow, blue and red of the Venezuelan flag. But, all show the signs of a long journey made to this city along the border on buses and cars or by foot from all corners of Venezuela. And most portray the misery many of their carriers are fleeing as the South American nation is dragged deeper into chaos. People cross the Simon Bolivar International Bridge from Venezuela into Cucuta, Colombia. More than 2 million Venezuelans have fled misery in their country in the past few years. ABC News traveled to Cucuta, a sandy town in eastern Colombia, where most Venezuelans have come to leave one desperate situation for another as they move farther into the continent. There are seven bridges connecting the two countries as well as an untold number of "trochas," or passages, that people use to cross. A Venezuelan woman falls asleep as she waits for her bus near the Simon Bolivar International Bridge in Cucuta, Colombia. For many Venezuelan migrants, the marathon journey out of their country continues farther into South America. At the Simon Bolivar International Bridge, the main border crossing here, a constant stream of humanity rushes in. Some travelers have plans to stay. Some have no choice but to do so, as their money runs scarce and their needs mount. Dreams of Peru, Ecuador, Chile and Argentina converge here as street vendors buzz around offering bus fare, food and ways to make money. "This is not the end but rather just the beginning. The people don't want to live there anymore. Every day they have less in their country, fewer opportunities," said Mauricio Franco, the chief of security for the city of Cucuta. 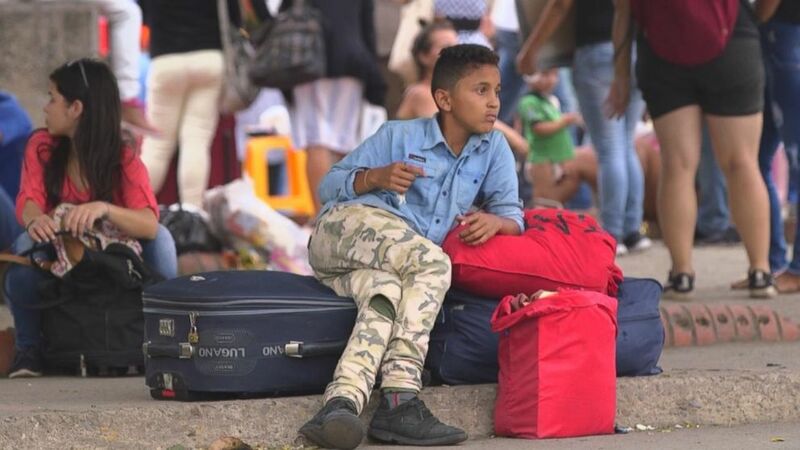 A Venezuelan boy guards bags at the Simon Bolivar International Bridge in Cucuta, Colombia. 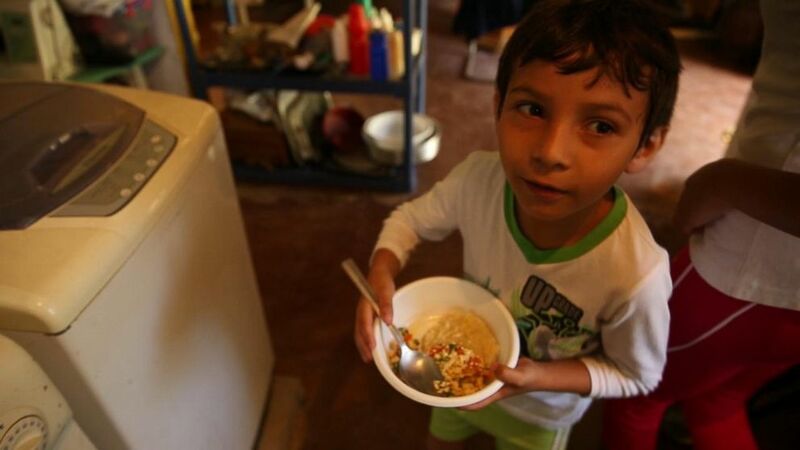 More than 2 million Venezuelans have fled misery in their country in the past few years. Father Francesco Bortignon runs the Scalabrini International Migration Network in the city. He told ABC News he had never seen anything like this in his decades working along the border. "There is no money. You don't find medicaments. So you simply die," he told ABC News' Matt Gutman. "It's a tragedy. Because if you see the condition that they live there, they can have little or nothing to eat." More than 3,000 Venezuelans make a one-way trip down this bridge every day into Colombia. Hunger and increasing poverty are the main drivers for this exodus. 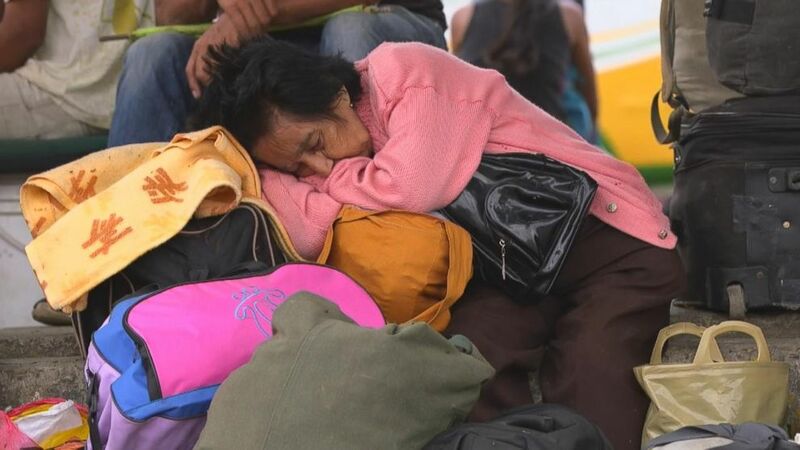 Just this year, more than half a million Venezuelans have crossed into Ecuador from Colombia. With more than two million Venezuelans now scattered across the subcontinent and more than 3 million now leaving outside their home country, it is one of the largest migrations in the Western Hemisphere, according to the United Nations. 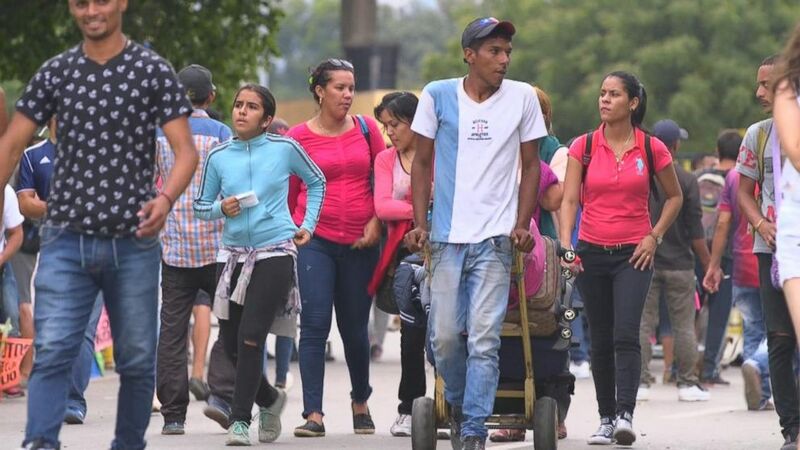 Many of the people crossing used to be middle class, making the mass exodus on foot from Venezuela a stunning fall from grace. Venezuelans are the largest group of asylum seekers in the U.S. Nearly 28,000 applications were submitted for asylum from Venezuelans last year alone, according to the U.S. Citizenship and Immigration Service. Some of the applications were for more than one individual. 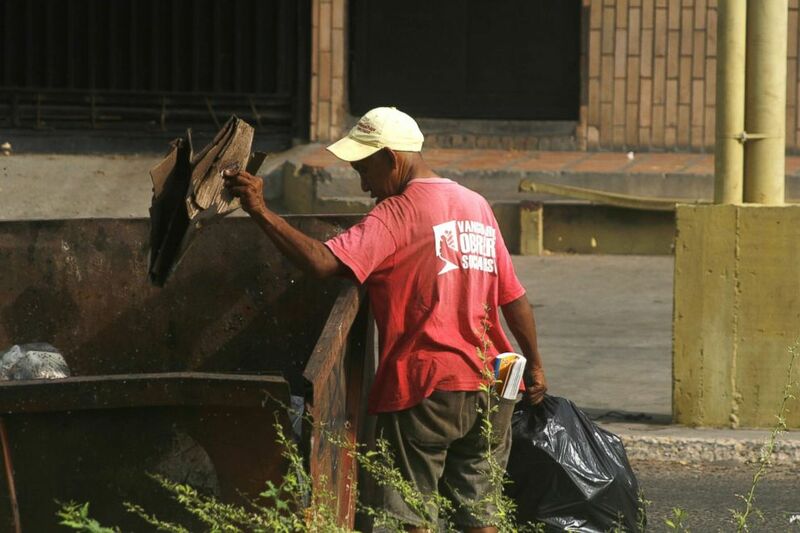 A man eats searches a trash container for food in Caracas, Venezuela. Food shortages and soaring inflation has forced many to rummage for food. They're leaving behind a situation they find untenable. Food is scarce or expensive. People from all walks of life have found themselves picking through the trash. For some, the only way to buy meat is to purchase rotten cuts at a discount. Inflation in the country is expected to hit 1 million percent by the end of this year, according to the International Monetary Fund, and a new currency change has plunged Venezuelans deeper into despair. ABC News first met Vanessa Posada and her husband, Adolfo, two years ago. They said they had to alternate eating dinner to make sure their son had enough to eat. A morsel of cheese was a luxury they rationed for their young son. "I can only afford to buy a small amount: 100 grams of Parmesan cheese. That's it," she said in the fall of 2016. Two years later, that cheese is unattainable. Teacher Vanessa Posada at her home in Venezuela. Soaring inflation and a crashing economy has forced her and her husband to skip meals in order to feed their son. "I don't know exactly how much it [cheese] is because I know it's too expensive and I can't buy it," she said. "I don't even ask anymore, because if I don't have enough money, why would I buy? Why would I ask for the price if my salary doesn't even cover that?" Posada, a teacher, now works two teaching jobs and several weekend gigs. She still can't make a living for her son. "A few days ago, my son told me he wanted to eat chicken. That's his dream: to eat chicken because that's something he used to do before," she said. "I can't even cover my kid's basic needs. It's not enough. Not my salary, not my husband's. It's not enough." 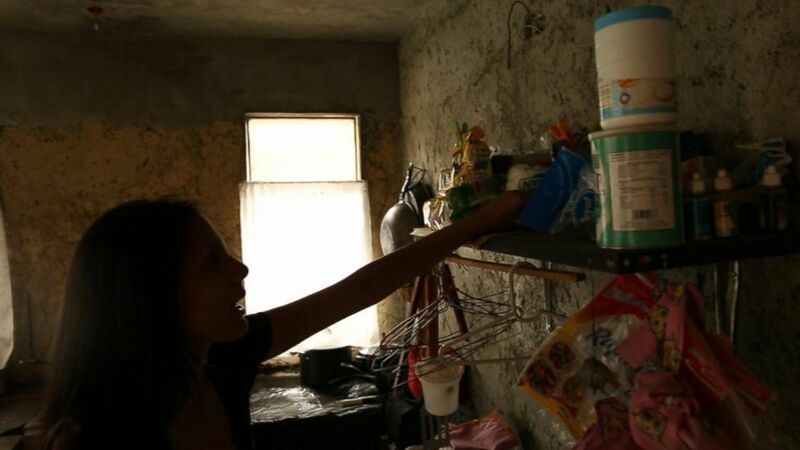 Teacher Vanessa Posada shows her pantry at her home in Venezuela. Due to soaring inflation, she sometimes prefers to get paid in food so she can feed her family. Inflation is so high that life has become impossible. The family is hanging by a thread to buy products like deodorant, shampoo and detergent and to make them last. "We try not to get our clothes dirty because, with soap costing over a thousand, over a million [bolivares], who can buy it? It's impossible," Posada said. "Before, I'd wash my hair every two days. Now it's every six or seven days. ... I have to straighten my hair so it stays cleaner and looks it. ... [I put] it in a ponytail so it doesn't get dirty." The rare protein they buy is eggs, and that's only for their son. Posada hasn't been able to afford meat in months, she said. Vanessa Posada had not bought any protein in months. Here, her son eats the eggs Posada was able to buy for him. Any protein she buys goes to him. At the heart of this is the growing discontent with the government of President Nicolas Maduro. Maduro has ruled Venezuela with an iron fist since first coming into power in 2013. Venezuelans who once took to the street to protest the government, in often-violent clashes, are now too hungry and tired to fight for anything but survival. Maduro claimed victory in the country's presidential elections in May, but many countries, including the U.S., have refused to recognize the results, saying the campaign and electoral process was a sham. 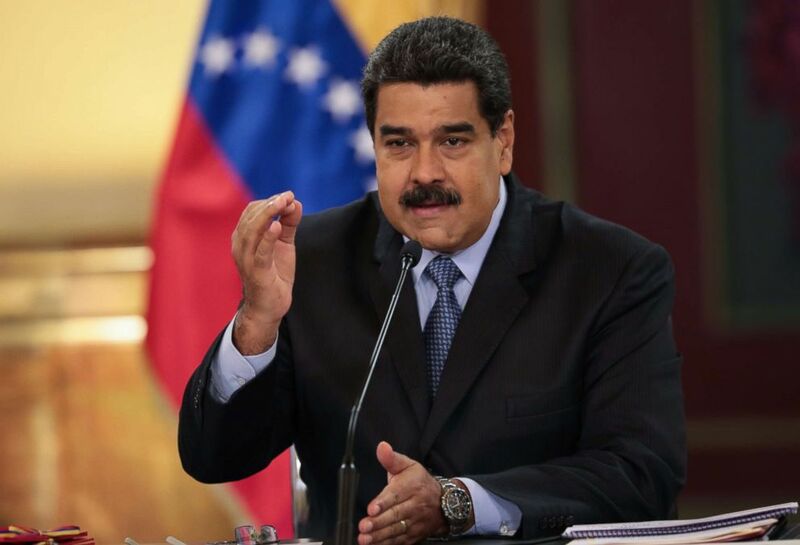 A handout photo made available by the Miraflores Press Office shows Venezuelan President Nicolas Maduro during a mandatory radio and television broadcast in Caracas, Venezuela, Aug. 17, 2018. Karen Hurtado, a nurse in the industrial city of Valencia, is among those who have decided to try their luck abroad. It took her months to save $200 to get to Lima, Peru, and she hoped to find work as a nurse there. "Our hands are tied," Hurtado told ABC News before leaving her husband and son behind. "It's just too difficult, the situation in this country. The truth is, there's no surviving this." Her husband, Ismael, drove her to the bus station, where a 14-hour ride would take her to the border with Colombia. He couldn't go with her because there was no money for an extra ticket and he lacked the documents needed to make the trip. "We've honestly tried it all. And at the end, the reward is nothing. It's nothing. ... 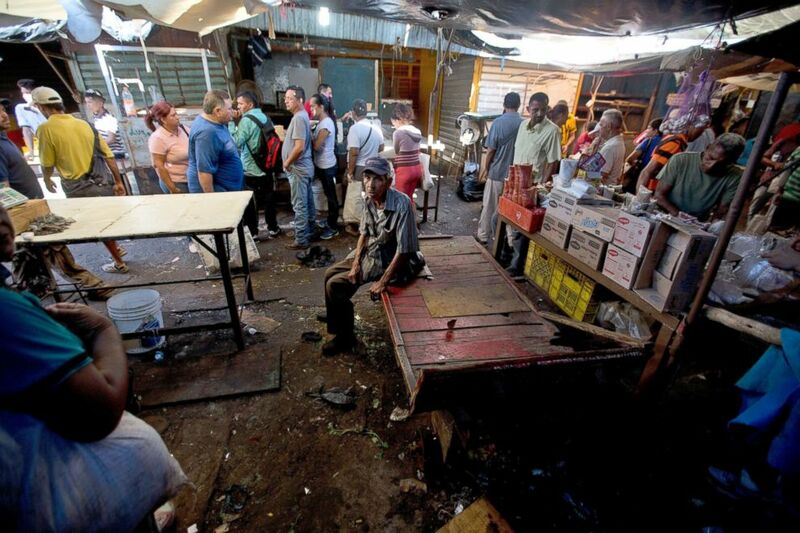 Working and studying is apparently not worth anything," said Ismael, Hurtado's husband. Customers stand in a practically empty Las Pulgas market, where vegetables and fruit are normally sold, in Maracaibo, Venezuela, Aug. 19, 2018. Their combined salaries were only enough to cover food and transportation for three days in their hometown of Valencia. Leaving seemed like the only solution. Hurtado carried her own food and water for the journey to Lima, a five- to six-day trip 4,300 miles south. She had to make several stops. 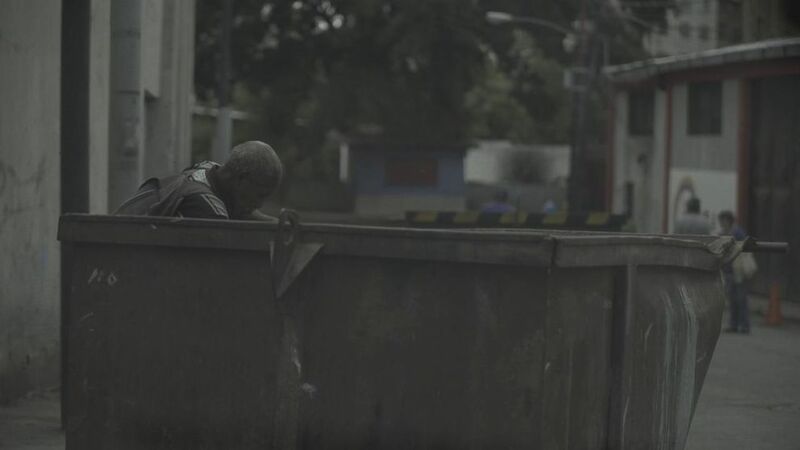 A man checks the trash to get food to eat in San Francisco,Venezuela, June 7, 2018. Venezuela's neighbors, once welcoming, are becoming increasingly overwhelmed by the influx of migrants. In Cucuta's general hospital, most of the patients are Venezuelans looking for treatments no longer available in their country. Measles and tuberculosis are among the diseases they bring across the border as vaccination there becomes rare. The hospital is also seeing an influx of pregnant women looking to give birth. The women say they can't find facilities or doctors to oversee their pregnancies. Mothers are also making desperate choices as their children languish with the effects of malnutrition. Ofreiber is nearly two years old and weighs just 13 pounds. His mother said he was born a healthy baby in Venezuela but started wasting away after Christmas. Now, he can barely keep his eyes open. 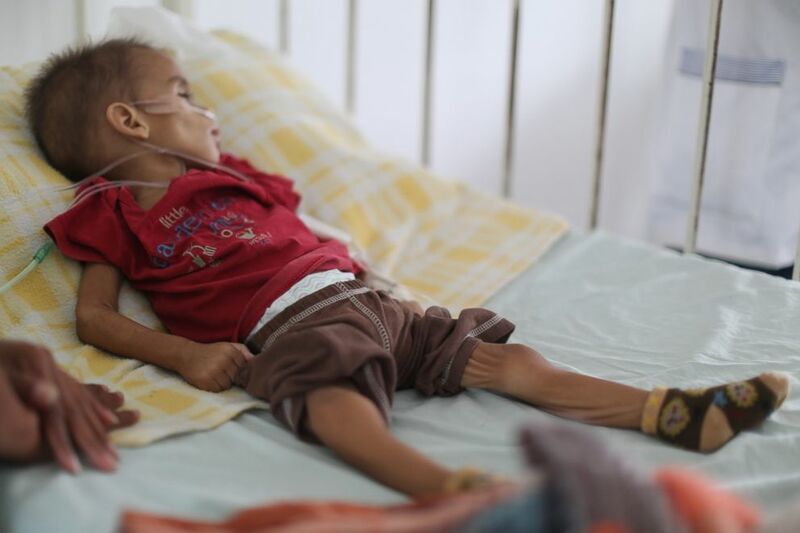 At a hospital in Cucuta, Colombia, Ofreiber, not even two years old, shows the signs of malnutrition many Venezuelan children suffer in their country. It took his mom a month and a half to find the money to bring him across the border. "If I had left him there, he would have slowly died," she told ABC News. Colombia, while still providing refuge for many and even giving work permits to some, is working to curb migration. The country is doing raids in border towns and driving those without the necessary paperwork to work or stay to the border and back to Venezuela. 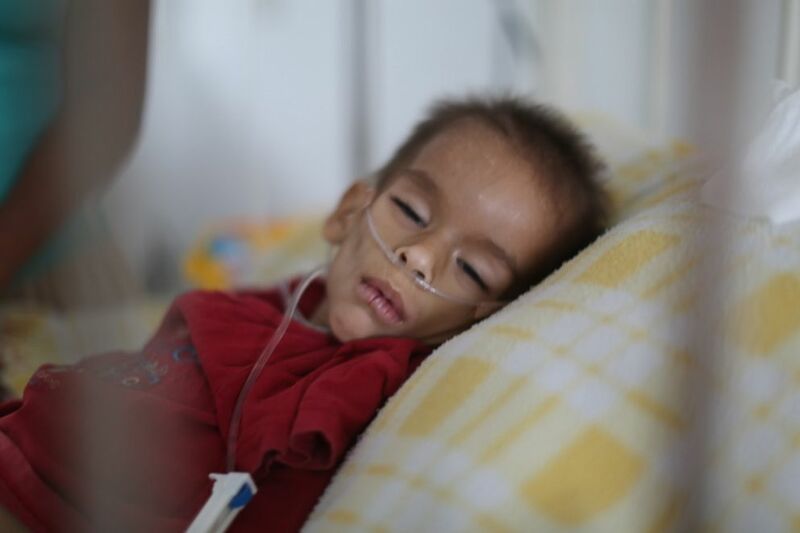 At a hospital in Cucuta, Colombia, Ofreiber, not even two years old, shows the signs of malnutrition many Venezuelan children suffer in their country. He is not able to open his eyes, move or talk. Colombia is not the only country overwhelmed. Ecuador declared a state of emergency in several states and Peru has tightened its work requirements, now demanding that Venezuelans have passports if they wish to stay in the country. In Brazil, the government has sent the military to the border after natives burned down Venezuelan encampments, cheering as the migrants were forced to walk back across the border. As Venezuela's crisis continues with no end in sight, the country is on pace to lose 10 percent of its population. "We never know how this story will end," the Scalabrini network's Bortignon said at the Colombian border. "Because the situation, political situation, in Venezuela won't change. ... So how many Venezuelans will be able to get out of the country?"